Happy First Day of Spring, Everyone! 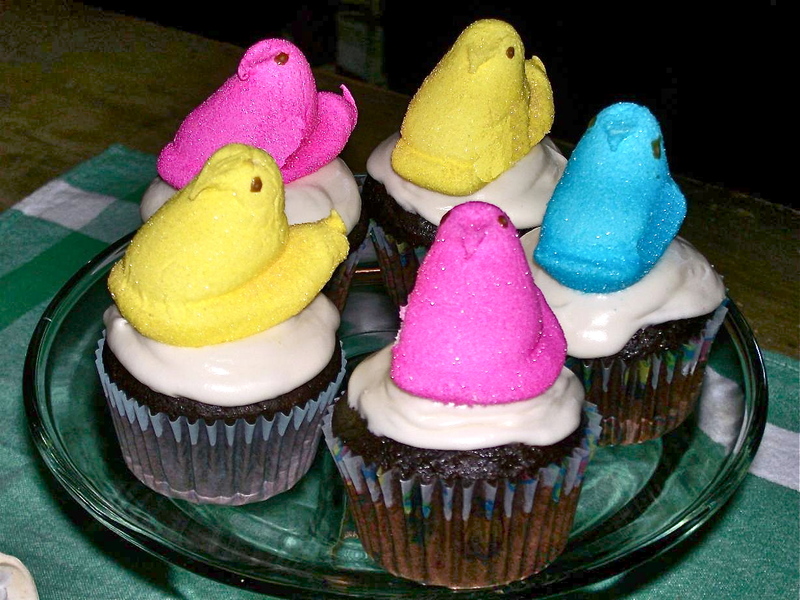 In celebration of the first day of Spring, I thought I would bring you an Easter/Springtime recipe to get you in the mood if you’re not already. We are preparing for yet another snow storm as I write this, and most everyone I know has had it up to HERE with cold, winter weather. So let’s all think of green grass, daffodils, tulips, bright spring clothes and no more jackets and coats. 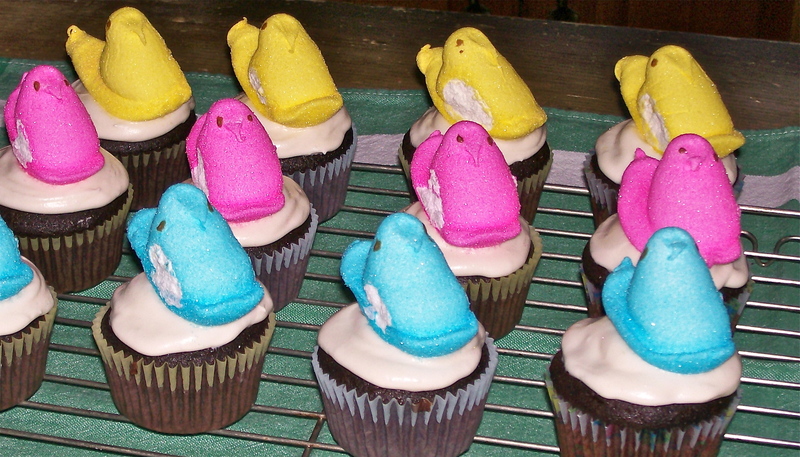 Hidden Egg Cupcakes with Peeps. We know that Easter egg hunts are great fun for children (of all ages). Another thing we know is that everyone loves cupcakes, and chocolate-filled eggs. Two delish things in one cupcake? Yes, mam! This recipe combines a Cadbury egg baked inside a chocolate cupcake, topped with vanilla buttercream. 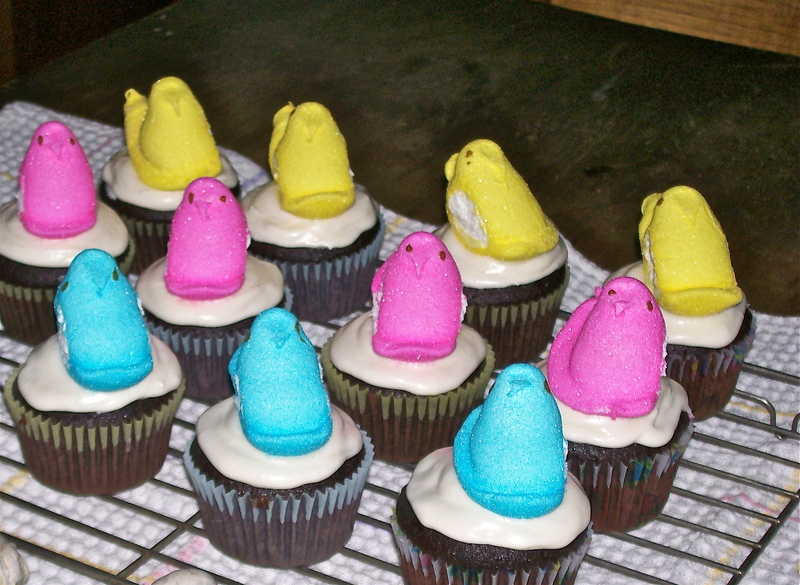 To take this concept one step further, after I had frosted the cupcakes I topped each one with a “peep” to give the idea of a bird or chicken sitting on an egg. These were made and photographed last Easter just after I started writing this blog. My photography skills were not very good back then and I have since improved quite a bit, but I’m sure you will get the idea of what they looked like. For the eggs I used Cadbury Eggs, the regular size ones, not the minis, and the cupcakes are a fudge chocolate recipe that I like a lot. Chicks and ducks make us think of Easter and Spring. There are two secrets to these cupcakes. They get their rich, extra-chocolaty flavor from a combination of unsweetened cocoa powder and bittersweet chocolate, and their soft, moist texture from a simple hand-mixing method. The frosting is a butter cream which I have written about before and you can find the recipe here. 1. Preheat oven to 350*F. Line a standard 12-cup muffin pan with paper liners. 2. In a bowl, whisk together the flour, cocoa powder, baking powder, and salt. Place the chocolate and butter in a large heatproof bowl set over (but not touching) simmering water in a saucepan. Stir frequently until melted and smooth, about 5 minutes. Remove the bowl from the saucepan; let the mixture cool to room temperature, 10-15 minutes. 3. Using a wooden spoon, stir the sugar into the chocolate mixture until combined. Stir in the eggs one at a time, beating until combined after each addition, and then beat in the vanilla. Gently fold in the flour mixture just until no traces of flour remain; do not over mix. 4. Spoon about 1/4 – 1/3 cup batter into each muffin cup. Place a Cadbury Egg in each cup large end down. Continue to fill the muffin cups with the remaining batter. Bake 22 – 24 minutes or until the tops seem set and “spring back” when touched lightly. A toothpick inserted a little off-center may come out with a few moist crumbs attached. 5. Let the cupcakes cool in the pan on a wire rack for 5 minutes. Transfer the cupcakes to the wire rack and let cool completely before frosting. 6. 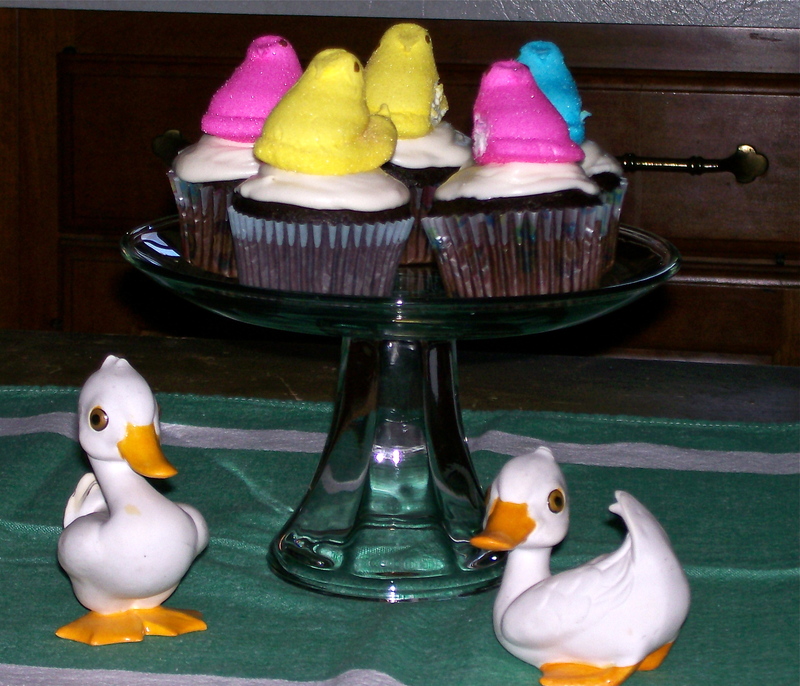 Frost cup cakes with vanilla buttercream, and place a “Peep” on top of each one. CUTE!